Education resources and learning opportunities from GenerationNation, the home of Youth Civics, Youth Voice, Kids Voting, K-12 civic education and other programs. Go to our new site www.GenerationNation.org for updated activities. We have exciting news to share as we reflect on Kids Voting Mecklenburg's 20th anniversary of connecting classroom education with civic learning opportunities, and look forward to a new year and bright future. We've taken considerable time and energy to reflect on our work and assess the future goals and needs of K-12 students: the next generation of leaders. With this milestone, feedback from hundreds of stakeholders, and the proud history that you have helped to establish, we have decided to change our organization's name to GenerationNation. We'll make an official announcement in January. We wanted to take this opportunity to share this news with you now, and thank you for your continued support. Our name is new. What's not changing? Our commitment and vision to educate and engage K-12 students to lead in their schools, communities and nation. We believe GenerationNation reflects the broad scope of our work to expand students' interest, understanding and involvement in government, leadership and civic life. Our programs help students in school, build civic literacy and develop young people as effective citizens and leaders. 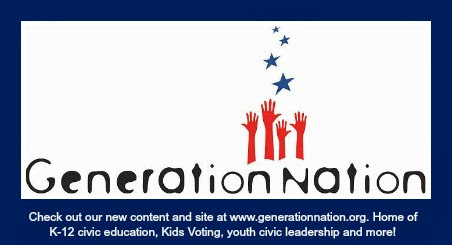 GenerationNation will be the home for the programs you have helped to make a success - the Kids Voting Mecklenburg election, YouthCivics, Youth Voice Leadership Alliance, K-12 civic education and a host of civic learning opportunities - and which we hope will grow, along with new initiatives. Without civic literacy, students can't graduate or become effective citizens and leaders. Who's impacted? You. Me. Everyone. Now, and for the future. Study after study shows that students know less about civics and history than math, English or science. More can name the American Idol judges than the 3 branches of federal government. Across all demographics, students know even less about local and state government. Civics and history are public school graduation requirements, yet due to education trends, budget cuts and learning opportunity gaps, many of today's K-12 students don't know how their governments and communities work. At the same time, our political climate is increasingly divisive. Students are watching. Is this the best we can do to educate the next generation of leaders? How can you help make a difference? Support GenerationNation, a nonprofit organization that provides the only opportunity for the civic education of K-12 students in our community. Your tax-deductible contribution by December 31 will help GenerationNation kick off 2012, and bright future, with a strong start. We hope you share our hope and excitement as we take this next step forward together. You'll be hearing more from us soon! In the meantime, please visit www.generationnation.org and connect with us on Facebook and Twitter. Kids Voting Mecklenburg is now GenerationNation. The education-focused nonprofit organization, founded in 1992, changed its name in December 2011 to better reflect the wide range of educational tools and learning opportunities the organization provides, and envisions, to positively impact K-12 students and the Charlotte area. Programs educate and engage students in government, leadership and civic life. Current initiatives of GenerationNation include K-12 civic education and teacher training, Youth Civics, Youth Voice Leadership Alliance, and the Kids Voting Mecklenburg election. Be careful when you follow links off of this site. While we review and make suggestions about helpful links and resources, GenerationNation is not responsible for video, audio, images, text and content on external sites.